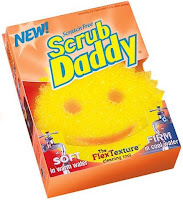 Why do they call it Scrub Daddy? Everyone knows that it's Mommies who do all the cleaning. Guess the manufacturer is trying to appeal to the ironic consumer. Tough as a man, lol. Depends on the man or situation of course.